The Italian government has created another massive turmoil in European markets with its 2019 budget proposal. Not only does it represent a huge increase in a country that already has 131% of debt over GDP, but a brief analysis of the tax revenue estimates shows that the figure presented is simply unattainable. Most independent analysts pointed the evidence of over-optimistic estimated revenues, raising fears of an additional 14 billion euro financial gap. 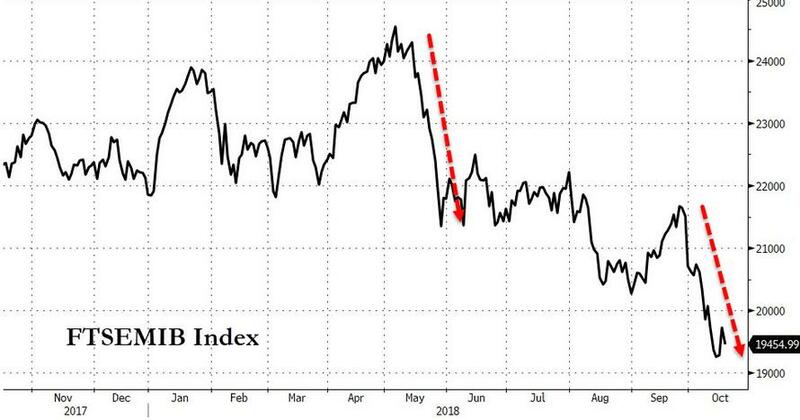 The Milan stock market collapsed, banks had to be suspended from trading after falling 6-7%, bond yields soared and the 10-year Italian bond fell to the worst level in a year despite the interventions of the European Central Bank. This is what happens when a country with enormous internal problems launches itself to the eternal magic solution of spending much more and increasing deficits. Many commented that this is the “price of sovereignty”. Someone has to enlighten me on how you achieve sovereignty raising debt and increasing current spending. 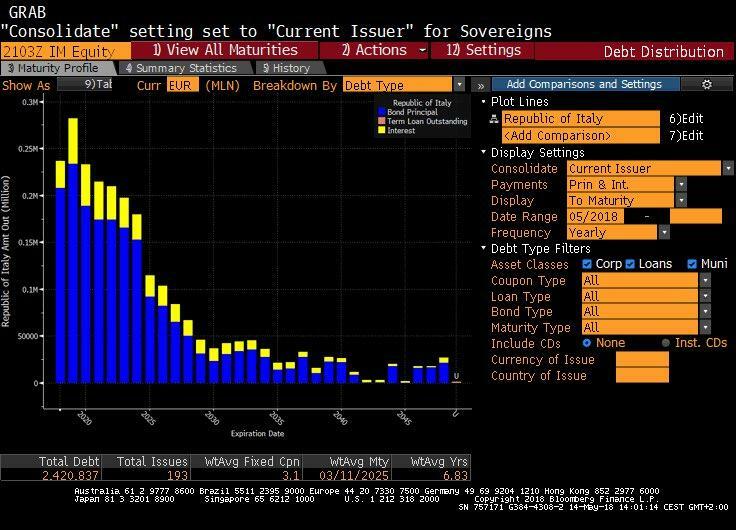 Anyone who believes raising imbalances and threatening with default and leaving the euro is going to be the solution for Italy ahead of billions in maturities and with banks burdened with enormous non-performing loans and government bonds, simply dreams. The prospect of capital controls, bank runs, and domino bankruptcies is even conservative. The biggest problem of the proposals is that they are the same old mistakes that never worked. Massive subsidies and political spending are not tools for growth but the recipe for stagnation and ultimately larger and more painful adjustments in the long term. 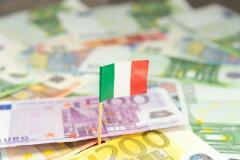 Italy has been one of the main beneficiaries of the ECB bond purchase program. 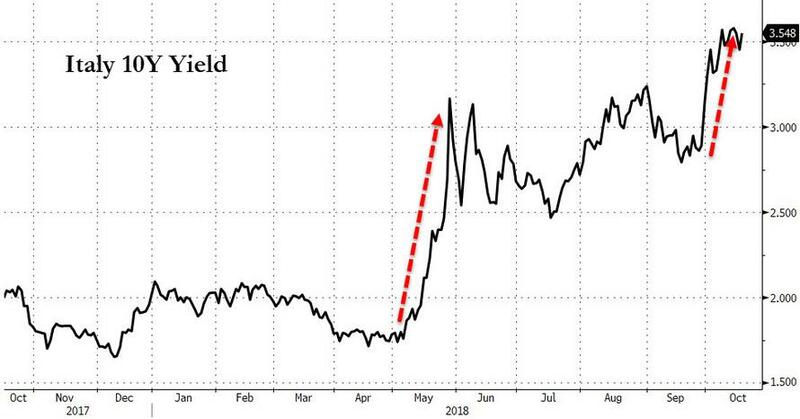 Despite the enormous bubble and bond yield compression created by the quantitative easing policy, Italian bond yields have soared. Imagine outside of the eurozone and with a central bank committed to copying Argentina and Turkish monetary policies, as Spain or Italy did before the euro. 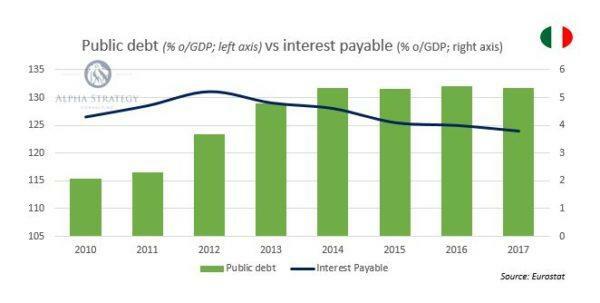 Italy’s enormous debt burden is not a consequence of “austerity”. It is misleading to define as austerity a Government spending of 48.9 percent of GDP in 2017. Government Spending to GDP in Italy averaged 49.83 percent from 1990 until 2017. The monster public spending that Italy is proposing is not the solution. Even less, it would be impossible outside of the euro, with the historical knowledge that the central bank would pursue an inflationary and purchasing-power destructing policy, as it did in the years before the euro. None of these problems are solved in this budget. In fact, they are worsened by increasing massively entitlements and subsidies. Many blame the euro. As if the same crowding out effect would not have happened outside of the single currency. The only difference is that outside the euro, the government would have destroyed savers and citizens through constant “competitive devaluations” that were the cause of the economic weaknesses of the past. Constant devaluations did not make Italy, Spain or Portugal more competitive, they made them perennially poor and perpetuated their imbalances. Corruption costs Italy a reported €60 billion a year, which amount to four percent of its GDP., according to the Corruption Perception Index. A problem that affects Spain as well. Increasing funds for politicians to manage only increases cronyism, special interests and perverse incentives. Devaluations were never a tool for competitiveness, but a tool for cronyism. And that has pushed Italy to stagnation. Blaming the euro will not save Italy. Increasing the imbalances that have led to stagnation will worsen its delicate situation. Magic solutions never work. What Italy needs is to reduce perverse incentives, special interests and stop subsiding the low productivity sectors while penalizing the high productivity ones. Italy’s problem is political spending. The same problem that this budget is going to increase massively.